This monstrous cultivar (supposed from Japan) has large bumped and tangled tubercles or warts on upper leaf surface and soft white teeth along the edges. Faucaria tuberculosa f. monstruosa hort. Mesembryanthemum ringens var. felina L.
Mesembryanthemum lupinum Haw. in Till. 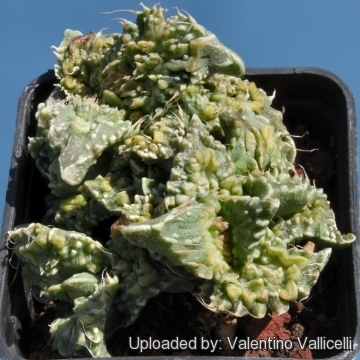 Description: Faucaria tuberculosa is a low growing clump-forming, perennial succulent, it is one of the easiest species to identify, since it is the only one with white tubercles on the top of the leaves. Leaves: In opposite pairs, all pairs growing at right angles to the next adjacent, usually with 2 to 4 pairs to a branch., they are up to 2,5 cm long, by 2 cm wide, dark green thick ovate-triangular in the top view, scattered in white rough tubercles over the upper surface and edged with soft white structures that look like teeth. Remarks: The cultivars "SUPER WARTY" is a selected form with large bumped and tangled tubercles or warts looking like a strange green marine creature. The petals of its flowers are also contorted monstrous. They need full sun to open fully and often don't open at all if the weather is cloudy, or if they are in the shade. Blooming time: Flowers will usually come out in the autumn (October or November) and bloom for several months (also in winter and spring if the growing conditions are adequate). The flowers open only in full sunlight. Faucaria candida L. Bolus: has large white flowers and leaves more or less uniform bright green without tubercles or pale speckling. Distribution: Cradock, Eastern Cape Province, South Africa. 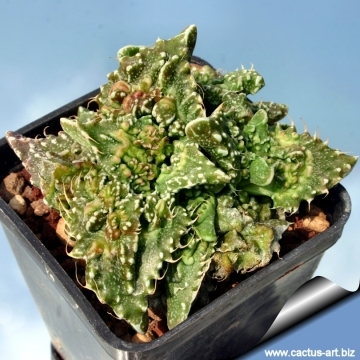 Faucaria cradockensis L. Bolus: ((syn: Faucaria felina subs. felina) has long unspotted leaves with white or pink teeth. Distribution: Hill above Cradock, Somerset East Dist., Eastern Cape. 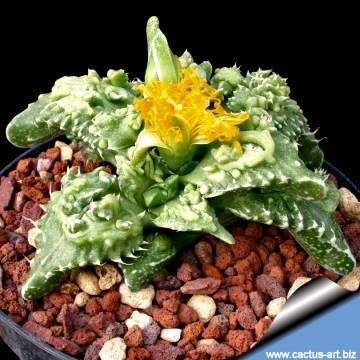 Faucaria felina Schwantes: has slender, spreading leaves with an oblique tip of the leaf. The lower number of teeth and the less spots separates it from Faucaria tigrina, which also has more erect leaves. Distribution: Eastern Cape-Province. Faucaria felina subs. britteniae (L. Bolus) L.E.Groen: has stouter whitish-grey green leaves, with darker-grey tiny dots, amd the keel meeting the upper leaf surface nearly at a right angle at the apex. Distribution: Albany, Grahamstown and Fort Beaufort, Eastern Cape. 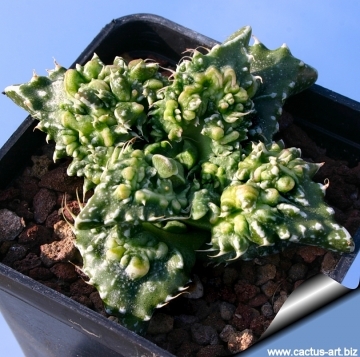 Faucaria felina subs. tuberculosa (Rolfe) L.E.Groen: Plant with large white tubercles or warts on upper leaf surface and soft white teeth along the edges. Cultivated plants shows a wide morphologic variability. Distribution: Bedford, Cape Province. 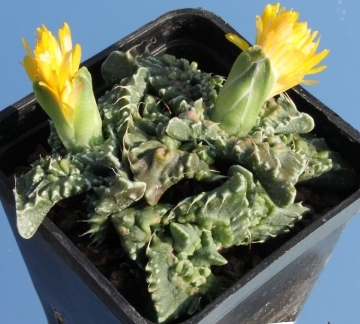 Faucaria felina subs. tuberculosa cv. Super Warty: has large bumped and tangled tubercles or warts on upper leaf surface and soft white teeth along the edges. Origin: supposed from Japan. 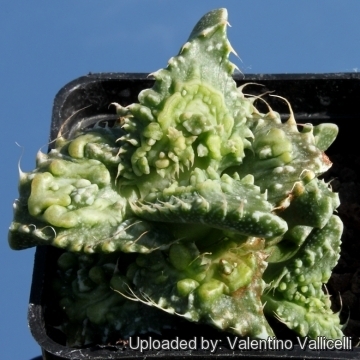 Faucaria longifolia L. Bolus: has long slender, more green leaves, keeled towards apex and with more numerous teeth. Distribution: Cape province. 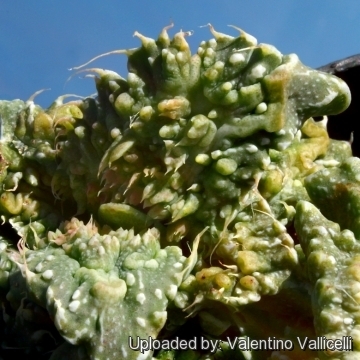 Faucaria lupina (Haw.) Schwantes: has silvery green, long, triangular leaves, with fierce-looking teeth along the upper margin. Distribution: Uitenhage, Eastern Cape Province. Faucaria speciosa L. Bolus: (syn: Faucaria felina subs. britteniae) has a more glaucous colour, and a rough leaf-surface. Distribution: Albany, Eastern Cape Province. Cultivation and Propagation: Faucarias are the good choice for anyone wanting to start growing succulents. They are quite hardy and can take a short period of light frost and in very dry warm regions these succulents make very impressive out door ground covers. As house plants they tend to grow in fair weather and rest when temperatures are too hot or too cool. Exposition: They need full sun to light shade , it should be protected from too much exposure in Summer. They do not do well in full shade as they tend to etiolate, fall over and rot easily. Soil: It likes a well-drained soil mix, but can tolerate a wide variety of soil types and growing locations as long as there is plenty of sun. Watering: This species is native to a primarily summer rainfall area but in cultivation the plant can be watered year-round. The plants are well watered during the growing season and allowed to dry thoroughly before watering again and will tolerate some over watering, but the challenge is to help them keep their compact form and prevent elongation of the stem. During the winter months, the plants should be kept quite dry, only watering enough to keep the leaves from shrivelling. Pest & diseases: Faucarias are sensitive to mealybugs. Rot: Rot is only a minor problem with Faucaria if the plants are watered and “aired” correctly. If they are not, fungicides won't help all that much. Care must be given in watering, keeping them warm and wet while growing, and cooler and dry when dormant. 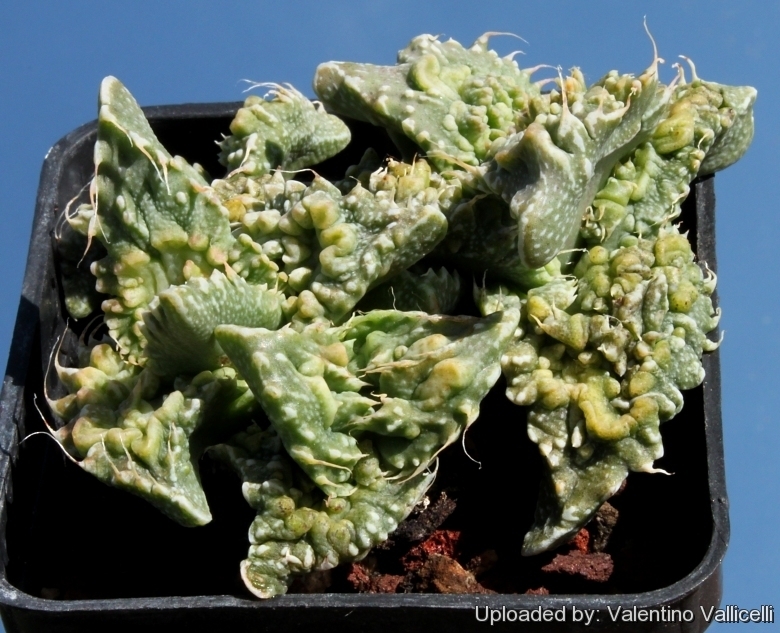 Propagation: Faucaria is very easy to start from seed. Seeds germinate in 7-14 days at 21°C. Although they will start from cuttings, it is quite difficult to get them to root. If they start to rot there is usually part of the plant that can be removed and possibly rooted.